Squarespace makes building beautiful sites simple. The flexible, intuitive site builder offers a myriad of options to help you create the site of your dreams — whether you want to showcase your photography in an online gallery, market your services, or sell products with an online store. Creating a gorgeous site can take a matter of an afternoon and there’s no need to hire a professional web developer to help. Squarespace is also an SEO nightmare for the uninitiated. Now, full disclaimer: I use a Squarespace site. I love my site. I just wish I could have learned about these mistakes months ago when I first started building my site. So, borrow from my mistakes and get your Squarespace site off to a better start! There’s a myth circulating that Squarespace isn’t good for SEO. Despite what I said above, it really isn’t true. It’s very hard to completely torpedo your site’s SEO if you follow their native SEO tools and tips. 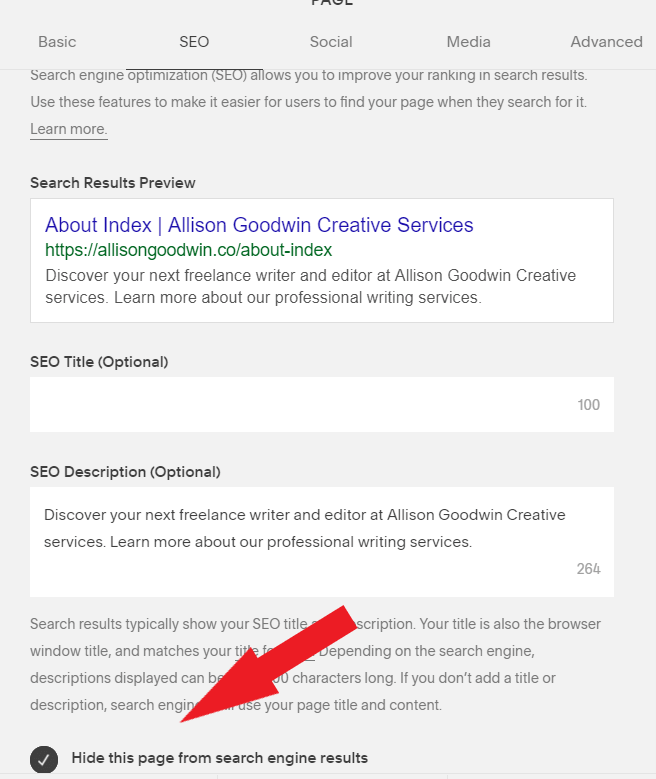 The SEO tab that appears in every page’s settings is a fantastic tool, which shows you a SERP preview of your metadata, the number of characters you have remaining, and a simple, but informational, explanation of metadata. The metadata for one of the sub-pages on my index page. 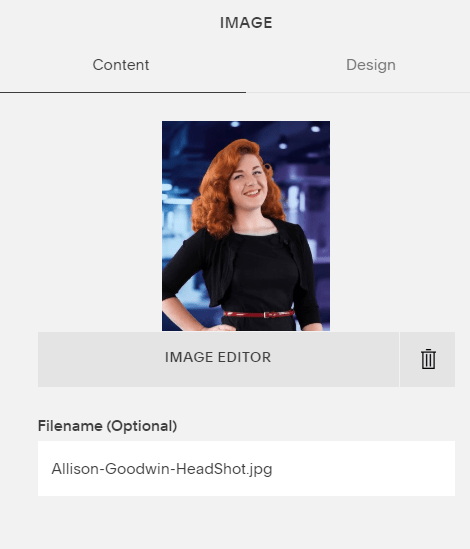 Additionally, Squarespace does some handy, coding-free SEO work, like making no-index tags a simple checkbox, automatically encouraging the use of H1-H3 headings, and using your image captions as alt text tags (more on this later). They also provide a native analytics tool and make it quite simple to connect with other tools, such as Google Search Console and Analytics. They even generate your sitemap and make it easy to find for submission to search engines (hint: just add /sitemap.xml to the end of your domain and you’ve got it). All-in-all, if you’re not looking to drive organic traffic to your site and play the ranking game, Squarespace has you covered without too much effort on your part. If you do want to practice your SEO techniques and compete for rankings with your Squarespace site, well, keep reading. Now, for those who are unfamiliar with SEO beyond more than a basic concept, search engines like Google and Bing use a variety of factors to score your site and determine how well it ranks in any given search. As of December 2018, Backlinko identifies 200 such factors for Google. Many, many of these factors are based on user behaviors… which is not exactly something you can control. They are, however, pretty easily influenced. Obviously, we can’t force searchers to click on our site or stay there — but you can make it very tempting to do so. Sometimes, though, Squarespace can still nuke these ranking factors without you ever realizing it. No amount of excellent content is going to make up for Squarespace misleading Google to think your site isn’t user-friendly when it is. Here are some of the ways Squarespace can harm your rankings. Were you all googly-eyed over Squarespace’s really cool index page feature? I was! You can stack individual pages to create a sectioned view of your site’s content or present lots of smaller sub-pages in a gallery style. Easy for your visitors to find what they need, gorgeous to look at, and really easy to organize and re-organize, index pages seem like a site builder’s dream. As it turns out (and sadly, it wasn’t me who figured this out) that those super-cool index pages are treated as a single page when it comes to analytic tracking. This means that no matter how many thumbnails are clicked to open sub-pages or how far a user scrolls down your index page, their traffic is treated as if they landed on your home page and went no further. Why is this? Well, it’s a little complicated but I’ll give it a shot. Basically, the way that these sites are handled is with a feature called AJAX loading. It makes for a user-friendly experience and faster load times for content, but it uses a system that treats subpages not as the unique URLs that they are, but rather as anchors to other places on the home page. End result? High bounce rates. Not a great look for your site, according to Google. Sites with structure rank better, so if your site is handling like that one-page biography site you built for your high school computer science class, you’re not going to be happy with your ranking position. Colin Irwin, a Squarespace developer, created a script that fixes the underreported index page traffic. I, however, created my own solution because I am on a Personal Plan and therefore am not allowed to code on my own site. My solution: links. Lots of ‘em. See, when I had ALL my site content on an index page, there was zero reason for my users not to click on my navigation links, which would have taken them to the single-page version of my index page subsections, not just their spot on the index. So, I went through and I built a second layer of my site. The no-index option keeps this page from showing up in search results. Find it under SEO settings in your page settings. I proceeded to do that for most of the pages on my site until I was able to build out a clear, easy-to-navigate site structure. For users who want to know more, they now can navigate to an entirely new page, thus telling search engines that they liked my site enough to keep clicking through it. 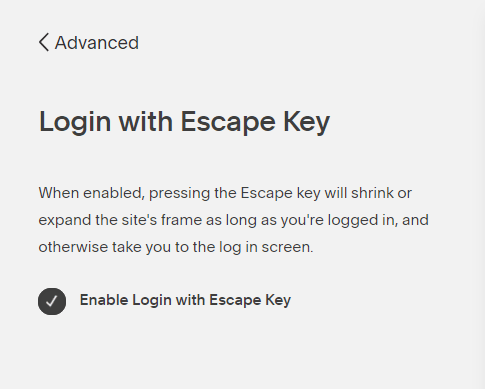 Squarespace has a unique way to login to the back end of your site using the escape key to shrink down your site’s frame and put you into editing mode by using the escape key. The setting is in the Advanced section of your site settings. The setting for logging in with your escape key is a handy tool, but can be hard on your bounce rate. Your back-end site runs on a different URL than your front-end site does, but you can use the escape key to move from your custom domain to the hidden Squarespace subdomain. Your back-end domain is automatically assigned by Squarespace and is tied to your site itself. It can be changed, but it will always look something like customname.squarespace.com. What I didn’t realize is that, while Squarespace analytics isn’t supposed to track your interactions with your site while you’re logged in (it ignores the IP address of the logged-in device), Google Search Console and Google Analytics certainly do. Which means I was visiting allisongoodwin.co, and then promptly bouncing off of it to another site — my back-end domain. Every. Single. Day. I’m still waiting for the changes from this realization to drop off my analytics tools, but maybe I’ll have some nice before-and-after screen caps for when it does. But your takeaway: bookmark your back-end domain, and go to that if you’re going to use the escape key to log in. Alt text tags are little pieces of code that accompany images on your site. You don’t see them if everything loads like normal, but if you’re a visually impaired user using a screen reader or a search bot crawling a site and indexing content, these tags tell you what the image is of. Neither screen readers nor bots can “look” at an image the way we sighted people can, so we provide a text substitute to describe the image. You may just want to put something like “German Shepherd” in as alt text, or you may want to provide a detailed description of the image. Either way, using alt text makes for accessible sites (yay!) and the ability to rank in image searches (yay!). Squarespace, however, doesn’t make it easy. 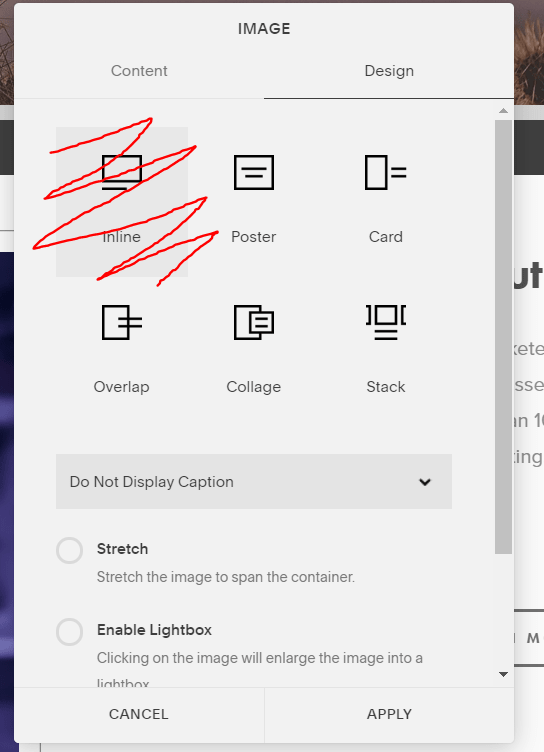 Whereas WordPress has a unique option to add alt text AND a description… Squarespace sticks us with captions-as-descriptions nonsense, and then doesn’t tell us that’s what’s going on. From a disabled developer — not cool, Squarespace. Accessibility should be effortless. I know — my graphic design skills are fantastic. The non-scribbled image options are covered in the tutorial linked below. Custom filenames for images can help screenreaders and bots figure out the content of images, even if your alt text isn’t the greatest. As you can see above, my Services index page serves as a folder for my sub-subpages that detail each service. 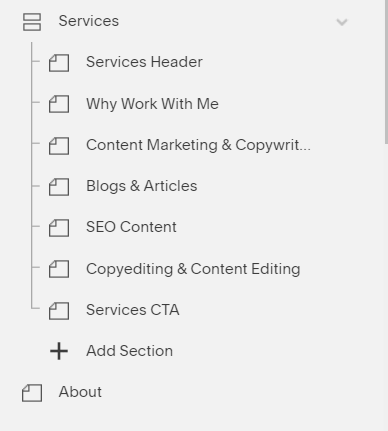 The About page is on the same level as the Services index when it comes to my site structure. Fortunately, this is easy to fix. Just go to your page’s settings, and correct your URL slug to show the right folder in front of it. 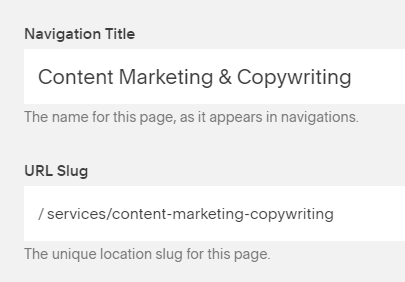 This means that I can tell search engines that “/content-marketing-copywriting” isn’t a stand-alone page, but rather a subpage of “/services” which is, in turn, a subpage of my root domain. I try not to go more than three levels deep in my navigation, since a) I don’t have that much content and b) it’s infuriating to get directed deeper and deeper into a site in search of the info you want. Squarespace lets you choose your URL slug, so make sure that you do take the time to organize your site structure with custom URLs. Now my sitemap reflects my structure and Google is pleased my offering. 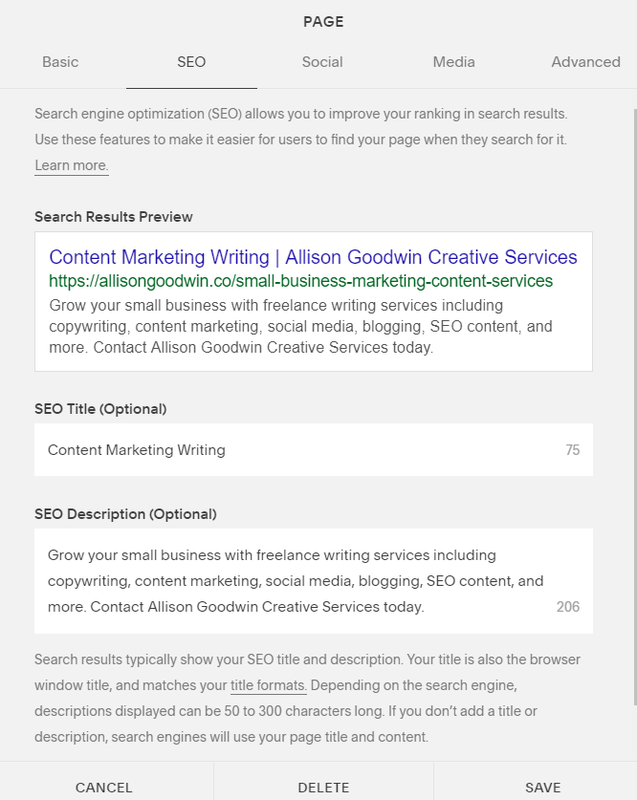 SEO is a detailed practice, but there’s plenty of advice out there to make the most of Squarespace’s platform and make sure that your site performs to the best of its ability. Don’t be afraid to experiment with your site and find out what works — and what doesn’t. Have any Squarespace SEO tips or mistakes to share? Tell me in the comments! All screencaps were taken by the author. Originally published on Alley Writes Good.